A Right Of Way Survey is a boundary survey depicting the limits of private ownership and that of the entity/agency that has the interest or jurisdiction of the subject property. Depending on the location of the site, the entity/agency may be the State, County, or City government. Right Of Way is usually considered as being owned by the entity, unlike an easement which is the right of use over the property of others. Title to the Right of Way may exist by different sources that include Dedication, Acquisition, Eminent Domain, and Maintenance. Many times it is a combination of these that make the total parcel. The most important part of a right of way survey is the research. The surveyor will make a determination of the position of the deeded right of way. If there appears to be additional Right Of Way by maintenance that has been uninterrupted for more than 4 years, an updated maintained map may be filed. A Right Of Way survey does not include above or below ground improvements, features, or encroachments. If a location/topographic survey is required for you or your client please see the Route Survey page this website. To the advantage of our clients, here at Rapid Surveying one of our project surveyors has a long background working for Florida Department of Transportation. 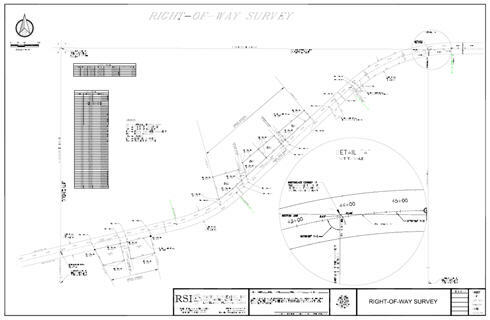 With this experience we can provide our clients with the confidence that there right of way survey has been produced with a professional attention to the details.